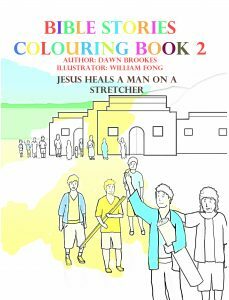 A wonderful children’s Bible story book covering one of the miracles of Jesus. Youthful rebellion, suffering and forgiveness are all covered in this short book. 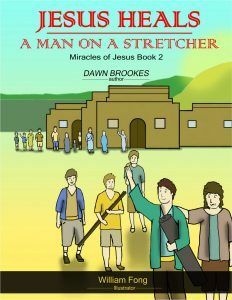 Jesus heals a man on a stretcher is the second book in ‘The Miracles of Jesus’ series. It is a Bible story based on the miracle of the healing of a man who was lowered through the roof of a house where Jesus was healing people. The story is told through the eyes of the man who was healed. It begins with his earlier life and how he came to be paralysed following an accident. Follow the twists and turns in the life of this man who grows up from being a bitter young boy to a joyful man. The reader can feel the excitement of the man as he moves from total disbelief to complete elation as he becomes the receiver of a miracle and is able to walk again. Illustrated throughout, this book will provide entertainment to children whilst providing a new way of learning a well known biblical story. This book is suitable for use in Sunday school and schools as well as for personal reading and learning. This book cleverly provides a credible and engaging back story to the traditional account of Jesus healing the lame man, by a description of events triggered by adolescent resentment and rebellion, which fits into a modern setting as well as a biblical one. Suitable for reading aloud or for reluctant readers to tackle themselves, I can see this book will be welcomed for use in school assemblies and libraries, mixed age Sunday School classes and as a gift. It will particularly appeal to boys who are hard to please. Recommended for ages 7-11.